Java status code: #*53696# (Samsung X600). If you want to unlock your phone put a sim from another company then type *#9998*3323# it will reset your phone. Push exit and then push 7, it will reset again. Put your other sim in and it will say sim lock, type in 00000000 then it should be unlocked. Type in *0141# then the green call button and it’s unlocked to all networks. This code may not work on the older phones and some of the newer phones. If it doesn’t work you will have to reset your phone without a sim in it by typing *#2767*2878# or *#9998*3855# (not tested). It may not work on all phones but with standard it is working. Don’t forget to share these Samsung secret codes list with your friends and family. We are not responsible for an accident with your mobile phones. 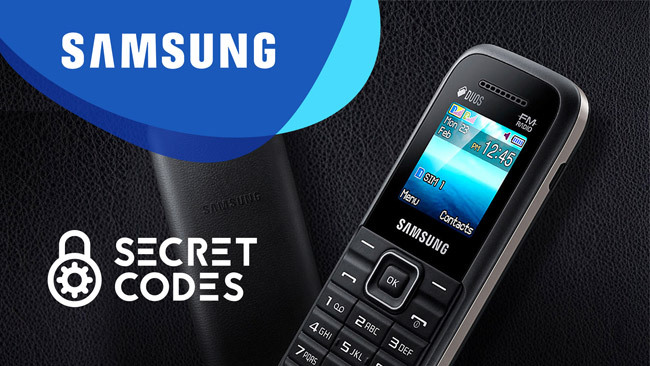 You trying these Samsung secret codes only at your own risk! We do not admit any explanation. Thanks. hey man please help me out..
am having problem with my S5610k i.e. Samsung primo handset..
after i switch it on, it says in the welcome screen and phone does not open / home screen shows.. I have a cell phone: Samsung e3300 accidentally clicked this code: Master reset (unlock) # * 7337 # and the phone ceased to recognize the sim of my cellular company. What can I do? my phone samsung primo s5610k. for reset my phone i just used #*7337# this code. After that no network in my phone…plz help me …i cant used my phone…. Can we give fixed time SMS in Mobile phone in samsung java application???????? can you please tell me the code for Resetting your phone to factory state-Only deletes application data and applications urgent !! Am having a problem with my samsung guru GT-E1282T Duos phone that it automatically refreshing the sim and after that it erase all the call log…..how can i stop this sim refreshing please replay me as soon as possible….thank you for your valuable time…..
i cant install big size program for my java phone.i cant biggest 500 k for my phone. Can i change java size? My Samsung Primo S5610k is not receiving any network after resetting the phone by #*7337#. Help me! Please. My Samsung GT S5610k is not receiving any network after resetting the phone by #*7337#. Help me! Please. #*7337# I HAVE DAIL AND NETWORK NOT FOUND PL HELP ME…. Help me guys what to do. Not receiving network after resetting my Samsung S3770K phone by *#733#. What to do please help me out? Phone lock password on gt e2222. I’m using Samsung C3322 accidently I locked my my sim and its asking for sim lock code for other sims. Please tell me the code to unlock it. I forget my password for phone lock so when I turn on I can’t go to menu what can I do? Help me please. I am using Samsung GTV 3322 there is a problem in the mobile it can’t download the Java apps and also show jar file is invalid for the previously downloaded jar file. How can I solve this problem? Please help me for removing sim lock in Samsung GT-C3312 Duos. How to OTG test run in GTE2152i phone? Samsung codes information is really innovative. It really helped many of us. Hello sir! I want to delete internet system in Samsung e1282T ? Please give some secret code. I have Samsung SGH-T479 T-mobile. My cell is frozen. I am unable to unlock it. Rajesh, thank you so much. One of the codes you provided did really help in solving an issue with my uncle’s phone. Please help me for removing sim lock in Samsung GT-E1500 Duos. How I use this code in Samsung sm-b360e.